These are very good rolls. 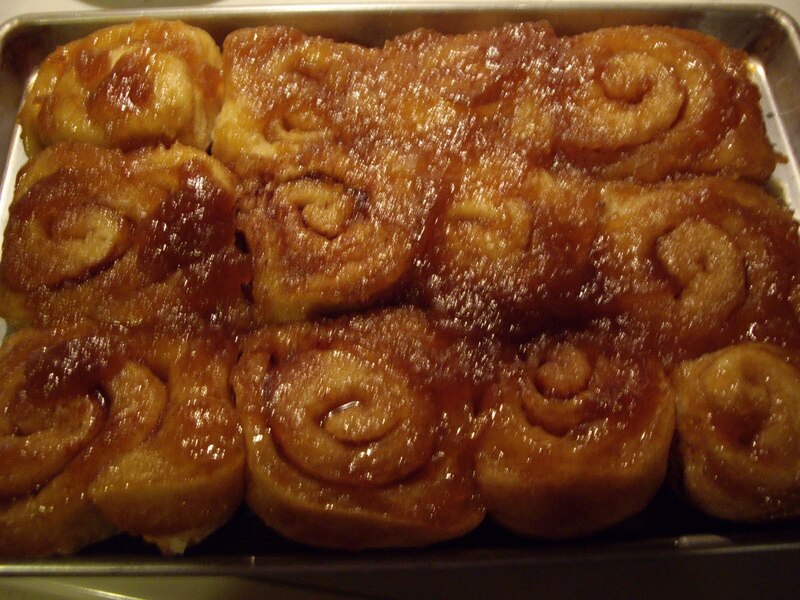 They are very light and a little different from your usual cinnamon or caramel rolls. They are also great for mornings. You make them up the night before and stick them in the fridge. In the morning, just pop them in the oven for a yummy breakfast. A larger rectangular pan or platter for serving. You will also need a rolling pin. Combine 1 cup flour, the sugar, salt, and yeast. Set aside. In a small saucepan warm the applesauce, milk, and butter. Heat just until butter almost melts. Add to the flour mixture with the egg. With a spoon or mixer stir in until everything is moistened. Add another 1-1/2 cups flour and mix in until dough pulls away from the sides of the bowl. Turn out the dough onto a floured surface and knead in the remaining flour. The dough should be smooth and elastic. If you have a mixer with a dough hook, use that and knead til dough is smooth and elastic. Put the dough into a greased bowl and cover. Put into a warm spot and let rise for about 45 minutes until double. Grease the 9″x13″ pan. Combine the topping ingredients in the bottom and spread it out evenly. When the dough has risen, roll it out on a floured surface into a 15″x12″ rectangle. Spread the butter evenly over the dough. Sprinkle the sugar and the cinnamon over the butter. Working from the long side, roll up the dough and pinch to seal. 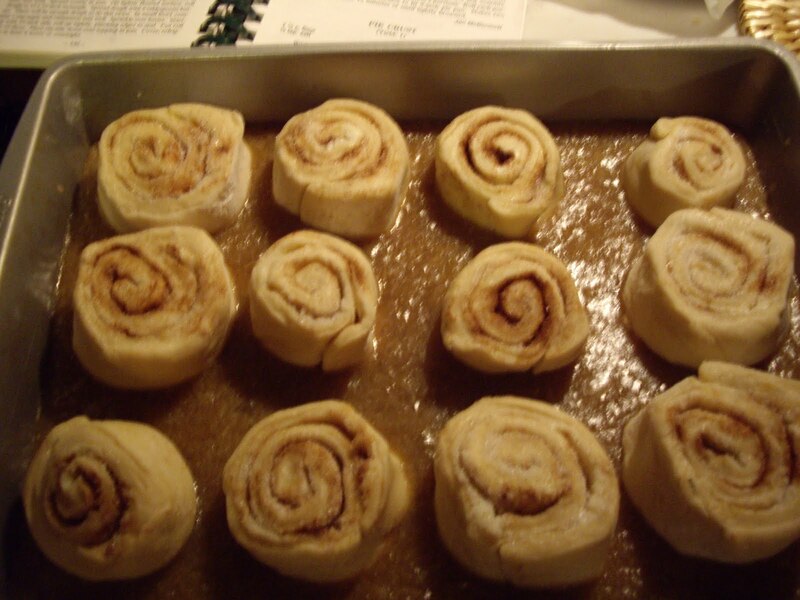 You want to roll tight enough that the sugar and cinnamon won’t come out. But you don’t want it too tight so that the middle of the roll pops out while it bakes. Cut the rolls into 12 even slices. Lay over the topping. Cover the pan with buttered foil and stick in the fridge. Buttering is just in case they rise too high and hit the foil. This way they won’t stick. 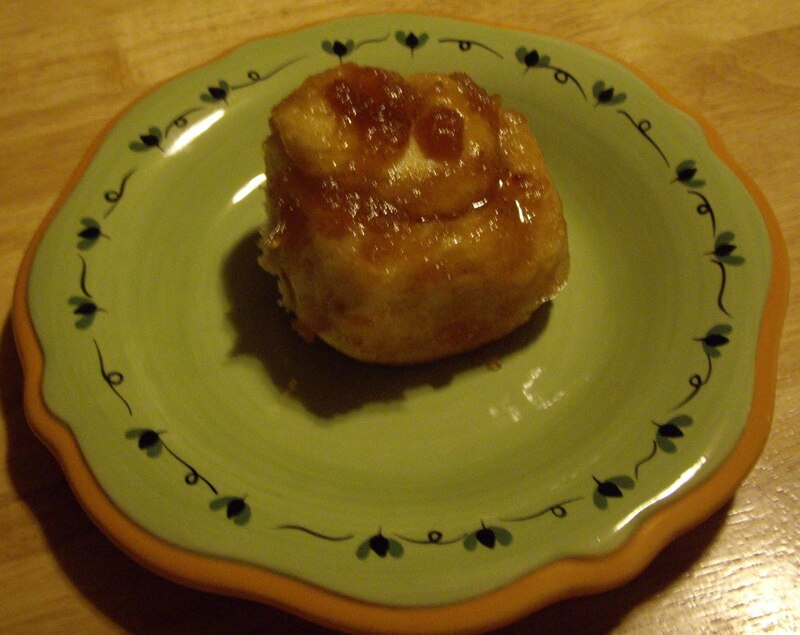 Take the rolls out of the fridge 30 minutes before baking. Preheat your oven to 400 degrees Fahrenheit. Uncover the rolls and bake for 20-25 minutes until golden brown. Remove from oven and let stand for 1 minute. Take your larger pan or platter and lay it top side down over the pan of rolls. Quickly flip both pans at once so the pan of rolls is bottom side down over the other pan. Carefully lift the baking pan off the rolls. Scrape any remaining topping out of the pan onto the rolls.